Have you seen the Swan River lately, or a neighborhood creek? Unless you're looking right now, or even if you are, the scene has probably been changing since you saw it last. That's partly why, in between an exciting round of backcountry navigation, bear, wolf, and lynx studies, our Wildlife in the West program began to explore our local waters last week. On Wednesday we read a seminal 2016 paper that identifies glacier-carved, gravel-bed river floodplains – like the Swan Valley – as the critical connector for diverse ecosystems across the mountainous West. We saw as much when examining the habitat complexity in the Swan and local creeks, now filled with new root wads, winter's windfall, and large woody debris sucked from the banks. It's an exciting time, for each of these features is already starting to braid, riffle, and pool the flow in a maze that fits the varied needs of bull and westslope cutthroat trout. With its Montana-inspired research, this paper also helped us remember the Swan River as a three dimensional system: not only the length we see like a blue ribbon in bird's-eye map-view, but also the width of the floodplain that expands or contracts based on the force of the flow. And, with equal importance, the river has a depth that goes to and through the gravels. At Bond Creek, we confirmed that layer in the gravels – the hyporheos (hypo = under, rheos = river) – is where some key action is. Far from being inert, this stony zone teems with maturing aquatic insects that are a foundation of the food web linking fish, frogs, birds, bears, and more. 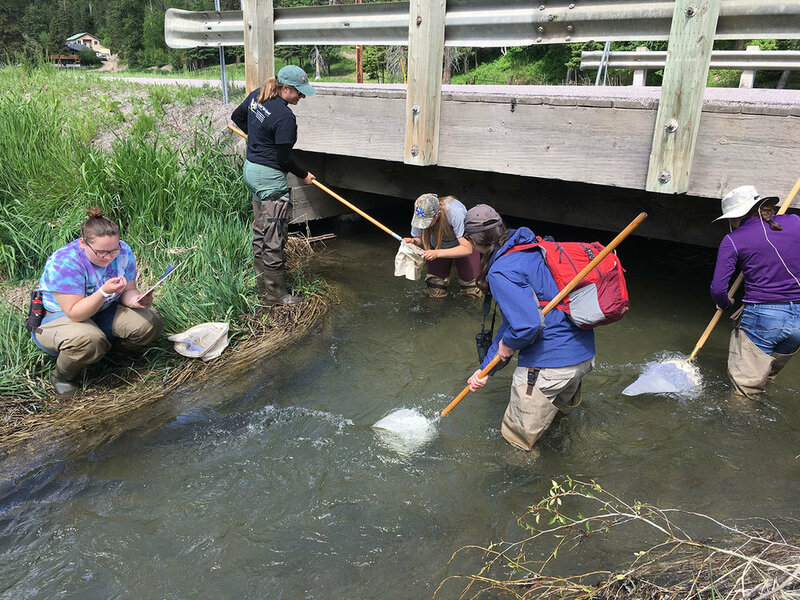 After our Bond Creek foray, we met with Beth Gardner, the Fisheries Biologist for the Flathead National Forest. Having held this post since 1994, she ably offered an entertaining, ever-nuanced string of stories about fish ecology and management in our complex watershed. Beth's infectious curiosity was evident to all, and we couldn't help but agree with her claim that the coolest part about working with water is the dynamism and mystery of it. She's amassed heaps of data over the years, but it's the questions – about a subject that's often unseen – that keeps her going. We ended the aquatic portion of the week with a special visit on Saturday. It began with a subtle brightening that was not merely sun, but the canopy, opening. Then a stillness, and below it, the rush of a stream with the konk-la-ree of red-winged blackbirds throughout. "Do you feel like we're approaching something," I asked Meghan, close behind me in our single file walk through the woods. "I think so," she answered, with a hint of wry expectation that told me that deep down, she knew. When such forces conspire, it is one of those magical times when the woods of the Swan Valley turn amphibious, revealing a wetland like a hidden gem. "It smells kind of like home," said Britney, who (like our entire crew) is familiar with these habitats from the well-watered east. But this particular jewel was Tipi Meadows, a special beaver-shaped wetland within a mile of the Beck Homestead. As a preface, we had read and discussed an excellent new article identifying the beaver as a keystone species supporting entire ecosystems. The article highlights how the beaver's creations are crucial to Oregon's ESA-listed coho salmon, and in similar ways, we appreciated how beaver wetlands can provide integral overwintering habitat, coldwater refugia, and food sources for the Swan Valley's threatened bull trout. We also explored a variety of novel approaches to nonlethal coexistence with beavers, and promising examples of beaver mimicry structures (aka beaver dam analogues, or BDAs) that can be used to help beavers help us. Along with the functioning dam (in rear of top picture) and one freshly-shorn stick, we found hundreds old cuttings, each with distinctive chisel work that seemed to beg for some kind archaeological or artistic interpretation. We clearly saw how the habitat was a boon for birds, and we had some especially good encounters with common yellowthroats and tree swallows. Amphibians too, including this long-toed salamander who happened to waddle amidst – and became a subject of – some impressive field journaling work!